Slow Cooker Corn Chowder is so easy to make and takes just a few minutes of prep! 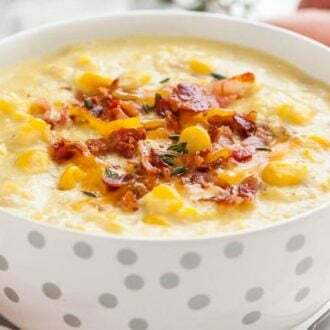 A creamy and flavorful potato corn chowder that's full of crispy bacon bits, sweet corn, and buttery red potatoes. It's the perfect soup for cold wintery weather that your whole family will love! Add chopped onion, cubed potatoes, frozen corn, and broth into the slow cooker and stir. Cover and cook on high for 3-4 hours or on low for 7-8 hours until the potatoes are tender. In a measuring cup combine the half and half with the cornstarch and whisk together until no lumps remain. Add in the half and half mixture to the slow cooker and stir. Cook on high for 15 minutes. Mash part of the potatoes for creaminess or use an immersion blender to puree the soup for a few seconds until you have the desired texture. Add black pepper, fresh thyme, and half of the crisp crumbled bacon. Stir until combined. Season with salt to taste. Serve with the remainder of the bacon and shredded cheddar sprinkled over the top.